My first look into flights from here to Spain or Portugal indicate that the cheapest destination is Madrid. Since our summer 2012 itinerary is southern Spain and Lisbon, Madrid is a bit inconvenient. We'd have to add the cost of a possible overnight in Madrid and then train tickets to Córdoba or Seville or Granada. For the first time, I'm considering trying out one of Europe's many low fare airlines. You know, like RyanAir. There are more: Condor (German), Windjet (Italian), Vueling (Spanish), Scandjet (Swedish), Aer Arann (Irish), and others. Maybe it would be more affordable to fly to one of their hubs and then hop on a discount connection to Seville, for example. There are disadvantages to consider though, like dependability, non-refundable tickets, etc. I would love some advice from any travelers out there who have utilized these airlines in the past. Are they worth the worry? First, I think Easyjet is (one of) the biggest and is missing on the sites. The only habit I have is regarding Easyjet who has massively start business in Geneva Airport 15 years ago and definitely changed the way French speaking swiss people do travels. Many business companies use it in short term travel altough sometime as expensive as good deals in main traditional companies. Long term reservation is perfect, I just booked gva - Lisboa for next June. 400$ for the familly 2 adults 2 kids. -Free sitting with kids can be difficult when trying to sit together... but you can pay an additional charge for a "priority boarding" that let's you board first and choose your place at ease. But definitely a good way to move around. We lived in Europe several years and used these discount airlines all the time with no problems. The only issue we ever had was having to book a long time in advance, which your doing, and airports far from cities, but this is better than your alternative (going via Madrid). 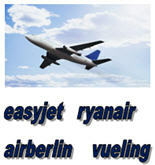 We used most often Easyjet and RyanAir. Good luck! Easyjet has better customer service than RyanAir. The key thing is to watch for the "hidden" charges -- charges for using your credit card, charges for booking a seat -- and avoid buying any extras. Otherwise, RyanAir in particular can come in *more* expensive than scheduled. I've been trying to find the cheapest airline tickets for a great family trip for our kids this fall, i think it's located in: (http://www.farecompare.com/travel-advice/vacations-for-kids-5-educational-trips-your-kids-will-love/), Has anyone had any luck with finding good deals on family resorts and air travel? @Nick: I don't usually do resort/air packages, I tend to book things separately. Thanks for the link. And read the fine print! Dig around on their website for fare rules and restrictions and what you'll have to pay for. The basic flight is cheap, but they make their money on surcharges for things that other airlines include in the fare. We have flown several of the airlines you mentioned and also these that weren't on your original list: Easy Jet, Wizz Air, Tui Fly, Blue,Meridiana, and Air Malta. All have been good and inexpensive experiences for us. Just be very clear on the luggage standards and extra costs. If you are coming from the States, you might want to consider flying into London and giving yourself enough time to change airlines (or in some cases airports). I know from personal experience that Ryan Air flies into Seville and I imagine Easy Jet does, too.